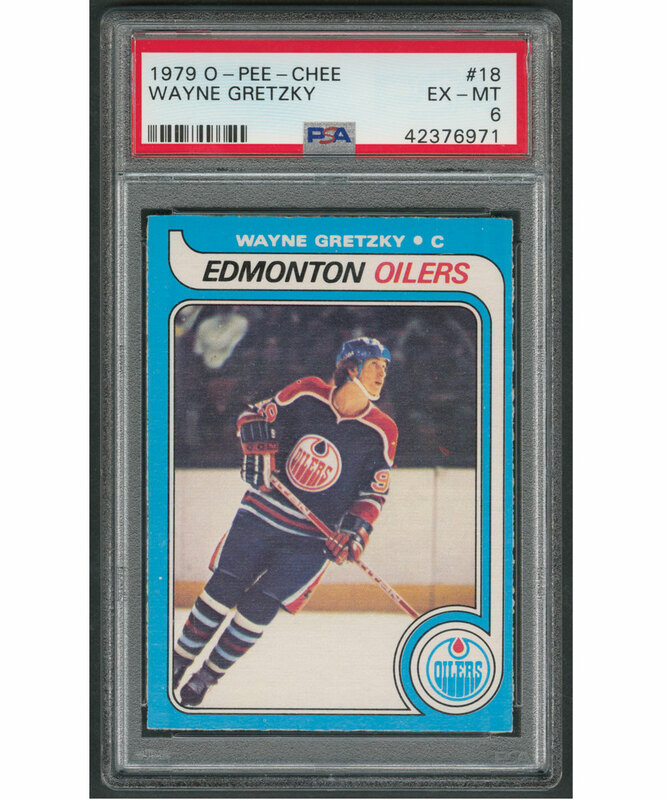 Is it any wonder why the Wayne Gretzky rookie card is the most coveted/bought/sold RC produced in the last 40 years? The Great One offensively dominated his sport like no other athlete had done in any sport, shattering the NHL record book with scoring/assisting exploits up until then unheard of and totally unimaginable. One hundred-plus point seasons were darn good seasons in the 1970s. A decade later, Wayne was averaging 200 points(!) over a six-season span. Do you think anyone will ever score 92 goals like Wayne did in 1981-82? We think not. A Wayne Gretzky O-Pee-Chee rookie card offered here has recently been examined by PSA, with the firm assigning it a mark of EX-MT 6. The image is right of center, with a white printing(?) spec visible in the left border and a less-than-smooth right edge to note. What a career, what a card.